Thomas Armstrong, Ph.D., an award-winning educator and expert on human development, offers a cross-cultural view of life's entire journey, from before birth to death to the possibilities of an afterlife. Dr. Armstrong cites both clinical research and anecdotal evidence in a comprehensive view of the challenges and opportunities we face at every stage of our development. His accessible narrative incorporates elements of history, literature, psychology, spirituality, and science in a fascinating guide to understanding our past as well as our future. "This is a thoroughly researched and beautifully written account of the story of human development. Drawing on the most recent scientific studies, as well as literature and films, mythology and major spiritual traditions, Armstrong shows the way to a truly integrated understanding of the complexities of the human life cycle." -- Ralph Metzner, Ph.D., author of Maps of Consciousness and The Unfolding Self, co-author (with Timothy Leary and Richard Alpert) of The Psychedelic Experience, which was the inspiration for the Beatles' song "Tomorrow Never Knows"
"The Human Odyssey is just that: a tour de force by one of the leading experts in whole person development. 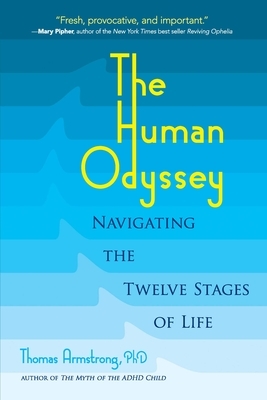 I've never before seen such a comprehensive and readable work on the many stages that we humans go through on our journey through this life." -- John W. Travis, M.D., founder of the first wellness center in the United States in 1975, co-author of Wellness Workbook, and co-founder of Alliance for Transforming the Lives of Children. "Thomas Armstrong has written a brilliant, caring and beautiful book on the human lifecycle. Such an all-inclusive book is rare and adds a sense of the wholeness of life, into and beyond death, in the mere reading of it." -- Stuart Sovatsky, Ph.D., author of Words From the Soul, Your Perfect Lips and Eros, Consciousness and Kundalini, and co-President of the Association of Transpersonal Psychology. Thomas Armstrong, Ph.D., is the author of 13 books that have garnered numerous awards and been translated into 20 languages, including the bestselling The Myth of the ADHD Child. He has appeared on national TV shows, and his articles have been featured in many popular and professional publications around the world. His website is www.institute4learning.com.